Mumbai: In the 150th year of the Tata Group, three independently written books on the Group are being published. 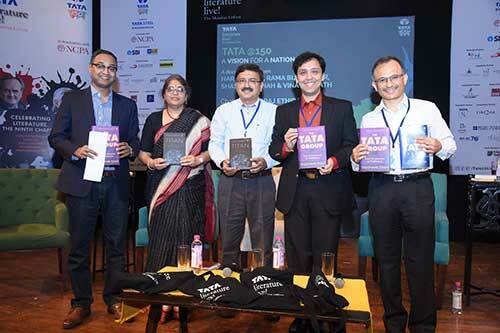 The books – ‘The Tata Group: From torchbearers to trailblazers’, ‘The Tata Saga’, and ‘Titan: Inside India’s Most Successful Consumer Brand’ – featuring interesting insights, case studies and success stories as also challenges faced by the Group, were launched today at the 9th edition of Tata Literature Live! The Mumbai LitFest at the National Centre of the Performing Arts (NCPA). The book launch was followed by a riveting discussion titled ‘Tata@150: A Vision for a Nation’ between Mr. Harish Bhat, Brand Custodian, Tata Sons, Ms. Rama Bijapurkar, acclaimed business-market strategist, Mr. Vinay Kamath, author of the book on Titan and Dr. Shashank Shah, author of ‘The Tata Group’ book with Mr. Govindraj Ethiraj, journalist, as the Chair. The power packed panel held an insightful discourse on the challenges and opportunities facing the Group as it keeps in step with changing times in the current economic and social milieu. Mr. Harish Bhat, Brand Custodian, Tata Sons, said, “The Tata Group is proud to be associated with Tata Literature Live! The Mumbai LitFest. This is in line with the Group’s commitment to the community. An important facet of this commitment is the nurturing of art, literature and ideas, which has always stimulated society to a greater good. A large number of books which are popular today are non-fiction titles about the corporate world. These business books provide us rich readings in relevant and interesting areas such as inspiring leadership, transformative management ideas and defining voyages of corporate history. ‘The Tata Group: from torchbearers to trailblazers’ authored by Dr. Shashank Shah is published by Penguin Random House. Dr. Shah is a researcher with Harvard Business Review. Researched over ten years, the book presents an insider account of achievements, conflicts, adventures within the Tata Group, spanning various eras and how it has successfully sustained its diverse businesses over the years. ‘The Tata Saga: Timeless Stories from India’s most Iconic Group’, an anthology of the best writings about the Tata Group published by Penguin Random House, is dedicated to 150 years of the Tata Group and includes chapters by R M Lala, S. Ramadorai, Harish Bhat and others with a foreword by Mr. Bhat.The book talks about the legacy of J. N. Tata, J. R. D. Tata and Ratan Tata and the pioneering work done by them in steel, aviation, automobile and other sectors. ‘Titan – Inside India’s most successful consumer brand’, authored by Vinay Kamath, Senior Assistant Editor, The Hindu Business Line, is published by Hachette, with a foreword by Mr. N. Chandrasekaran,Chairman, Tata Sons. This is the first book ever on the journey of Titan and commemorates 30 years of the brand this year. The Tata Group has always placed the community at the core of its businesses and has practiced strong business ethics coupled with social responsibility. Over the past 150 years, this vision has propelled the Tata Group into a global powerhouse, which has made an immeasurable contribution to India’s economic progress. Wonderful. Are the books also available in Kindle Edition?